Friday was a special day for Lindfield Cricket Club when Abidine Sakande took to the field at Hove to make his debut for Sussex against the touring Pakistanis, writes Gareth Cater. It capped a remarkable rise in a cricketing career that almost happened by accident after being spotted in the nets at Ardingly College. Known simply as Abi, the Oxford University graduate blossomed after joining Lindfield as a junior in 2006 and is the first LCC player to make the Sussex 1st XI since Paul Phillipson, who started his county career in 1970. At Hove, things got even more surreal for the club when Abi came on to bowl at Pakistani batsman Azhar Ali, who had also played a few games for the village in the early 2000s. As 2nd XI captain, I first picked Abi in 2009 when he was just 14. Indeed, the then 3rd XI captain Glen Lovelock and I still bicker about who spotted him first, and no doubt that argument will continue now that he’s plying his trade at the top level. In reality of course, he was encouraged to join Lindfield thanks to the chairman of the time, Mark Lawrence. In those days, Mark was also a significant force behind the growing reputation of the Lindfield Academy, and played a huge part in Abi’s early cricketing development. It’s saddening to think that after his tragically young death at 46, Mark never got to see Abi play for Sussex. He would have been immensely proud. I remember Abi’s 2nd XI debut like it was yesterday. On a gorgeous early summer afternoon at Sidley on the flatest of wickets, he opened the bowling with a 16-year-old James Pearce (who went on to captain the 1st XI). His figures of 2 for 26 were encouraging, but what sticks in the mind was the opening batsmen both calling for their helmets after a couple of overs. He had natural pace and an ability to hit the pitch from a very early age. His huge cricketing talent is coupled with a sharp intelligence, as one would expect from a St John’s College, Oxford student (indeed, he received his 2:1 in Human Sciences, the morning of his Sussex debut). Just weeks after his Sidley debut, we travelled to Seaford for an away fixture. As we left Lindfield, I asked Abi about the book he was reading. An hour later as we pulled into the ground, he’d just about finished his answer, after giving us a blow-by-blow account of the authour’s efforts to create a science-fiction masterpiece. To this day I can’t remember the title of the book. Of course, I was never going to keep hold of Abi in my team for long. By the end of that season he was a regular in the 1st XI, and in the following year, he had returned to Sidley and taken 6 for 46 to win the game. In fact by 2011, his talent had grown too big for Lindfield, and he was off to Three Bridges, and ultimately Billingshurst where he plays in the Premier league today. In between, he has achieved an Oxford blue in 2015 and 2016, with highlights including getting the wickets of Kevin Pietersen and Jason Roy in a first-class game against Surrey last year. He bowled a tidy 20 overs against the tourists with not much luck in the first innings, taking 0-52. Another six overs followed in a weather-shortened second Pakistan innings. I trust it won’t be too long before he troubles the scorers more seriously, and he knocks on the door of a List A or Championship appearance. All at Lindfield wish him the very best. * The Sussex-Pakistan game ended in a draw after a weather-hit final day. 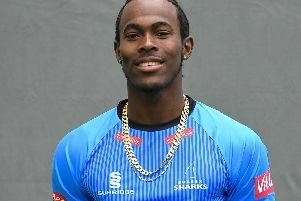 Another local Sussex League star, Jofra Archer, was the bowling star as Pakistan batted first and scored 363-5 declared. Archer took 4-49. Harry Finch (103) and Luke Wells (93) put on 212 for the first wicket in the Sussex reply and they declared on 291-5. Only 24 overs of the Pakistan second innings were possible as rain hit Hove on Sunday and they reached 71-1. The tourists now head for Lord’s for Thursday’s start of the first Test.